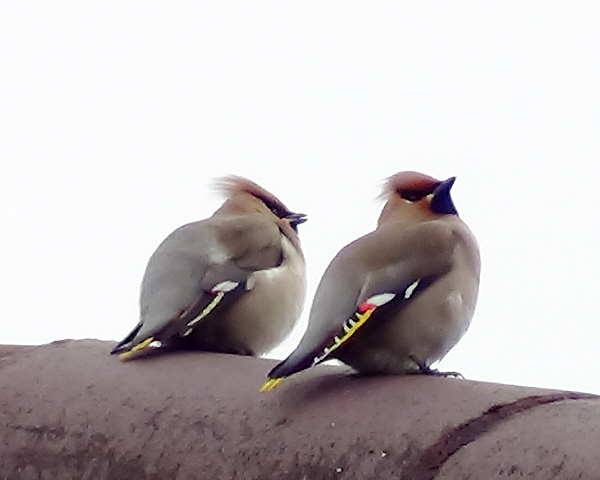 On the walk to my local birdwatching area of Baron's Haugh today, I saw a flock of Waxwing. There are birds I have been looking for since last Autumn and I was very glad to eventually see them. They were sitting on the roof of a block of flats and I managed to get some photographs of them using my video camera. 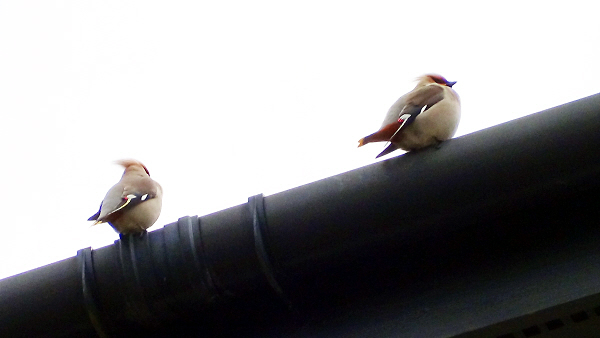 Waxwing have a soft silky plumage. They have unique red tips to some of their wing feathers which looks like sealing wax and gives the birds their name. Their main food is fruit. They are winter visitors and do not breed in the UK. They are a beautifully marked bird. 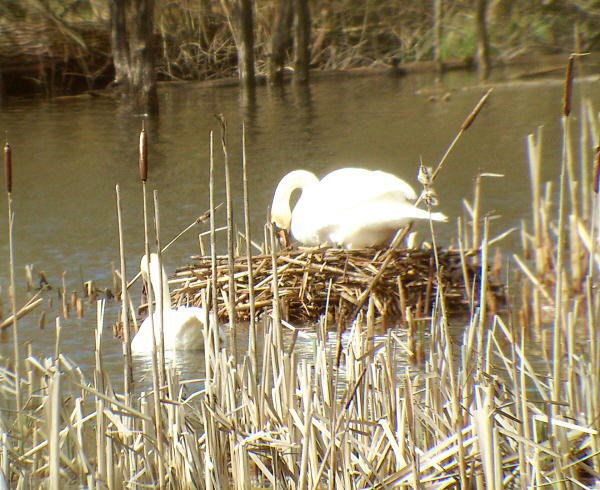 The pair of Mute Swans who had built their nest a few weeks ago were both together with the female sitting on the nest. she kept moving around and we thought that she may be about to lay an egg shortly. However, the male soon left the vicinity of the nest to swim into the Haugh. The female then started collecting more reeds and made some alterations to the living quarters. 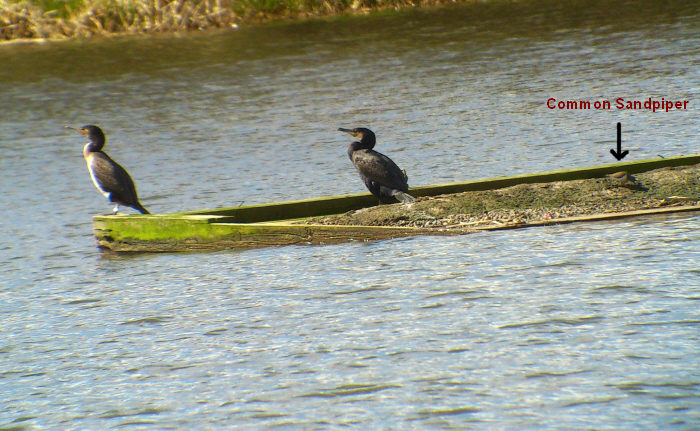 Over on the raft, two Cormorant were perched looking over the Haugh. On getting a closer look with the scope, we saw a Common Sandpiper on the raft beside them. This is a small wader with brown upperparts and white underparts. It bobs up and down as it moves and this is known as 'teetering'. The Sand Martins have arrived from Africa for the summer and Willow Warblers, another summer visitor, could be heard everywhere. Only two of the injured Whooper swans could be seen on the River Clyde but they had been joined by a Mute Swan. It may be that the other Whooper Swan was able to fly back to Iceland and there was no sign of it anywhere on the river. Looks like summer is around the corner. Baron's Haugh is an RSPB reserve in Motherwell, North Lanarkshire.